Nigel Thurlow is a Lean Evangelist, Continuous Improvement Leader, Quality Advocate, Agile & Scrum Coach, and a member of The Machine That Changed the World. Considered by many as an expert in Lean implementation and process improvement, gained from his early Toyota background, he evangelizes quality improvement and waste reduction through the implementation of systems thinking, agile practices, and the Scrum framework. Nigel led the successful Scrum transformation at 3M Healthcare Information Systems, and has taught and coached as a principal trainer and coach at Scrum Inc together with the co-creator of Scrum in notable companies such as GE, Bose, 3M, Microsoft, MIT and Toyota. 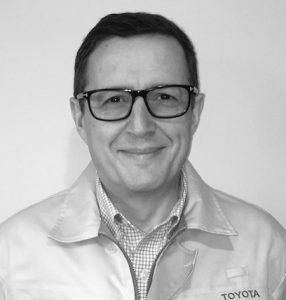 In 2017 following two and a half years training and certifying over 2000 people as a Certifying Scrum Trainer at Scrum Inc, Nigel has moved back to his roots and re-joined Toyota as the Chief of Agile with Toyota Connected, the Toyota company building the future of connected vehicle technologies. The world is changing rapidly and companies need to be agile. What is agile, and what does this mean? Why should we care? Technology and customer expectations are evolving, and companies need to evolve to respond to that change. Toyota are 18 months into an agile transformation. Discover why they need to adopt Agile and why being Lean is not enough on its own. How does traditional leadership view this changing world? What lessons are being learned? What patterns have been detected? What new techniques are they using to enable their agility? How is funding and contracting evolving to meet the different demands of business agility? How does Agile and Scrum work in an outsourcing model? Join Nigel Thurlow, Chief of Agile at Toyota Connected to learn the answers to these questions and more.